A portrait in the park? $10 The look on your face when Captain America rescues your purse? Priceless. 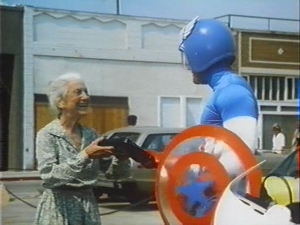 So Captain America II (no subtitle in the opening credits) opens with a standard TV credit sequence: a slide show of the main cast, punctuated by a shot from later of Cap popping a wheelie on his rocket bike. Once the four leads are given their due the rest of the credits play out atop…aww crap! It’s the same driving footage that opened the first film! NoooOOOOOOO! Already I’m having flashbacks! Somebody make it stop!